We are challenging students to hop of the bus and explore their new home through a social media scavenger hunt. 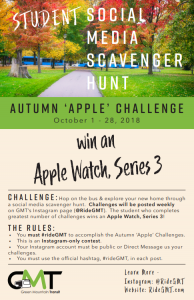 Complete as many of the Autumn ‘Apple’ Challenges by Sunday, October 28, 2018; the student who completes greatest number of challenges wins an Apple Watch, Series 3. The winner will be announced on Wednesday, October 31, 2018. Every Monday (10/01/18, 10/08/18, 10/15/18 and 10/22/18) GMT will post 2 Autumn ‘Apple’ Challenges on Instagram (@RideGMT). Every Saturday (10/06/18, 10/13/18, 10/20/18 and 10/27/18) GMT will post a bonus challenge on Instagram. If you accept the challenge, publicly post on Instagram or Direct Message us your challenges. You must #rideGMT to accomplish the Autumn ‘Apple’ Challenges. This is an Instagram-only contest. Your Instagram account must be public or Direct Message us your challenges. You must use the official hashtag, #rideGMT, in each post.